Club Miata Northwest is a Miata organization based in Washington. Demographics range in all ages, professions, and personal interests for over 180 members. The love for a Mazda Miata/MX-5 goes way beyond a wave to a fellow driver on the road. All over the Pacific Northwest, the club’s enthusiastic members gather for drives or just to talk about their favorite subjects. 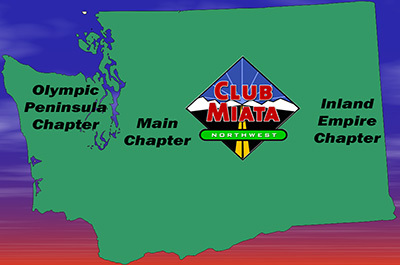 Club Miata Northwest was founded by a group of enthusiasts in 2002. After our first year, the membership reached to over 100 cars. The attractive and user-friendly website helps distinguish us as an all-electronic club. The website provides current, upcoming, and archived useful information. We're passionate about providing the very best Miata/MX5-related activities. We maintain a close relationship with regional, national, and international connections. Events which the members enjoy include: day-trips, overnight or multi-day excursions, tech sessions, and motorsports participation. Monthly rotating venue dinner meetings bring our community together. Our Member's Only Forum is an electronic outlet where all members can discuss Miata-related topics. Join the main club or a chapter near you.